“I had been praying for a bicycle for two years.” A BCM church-planter, Kendrek Tue pastors a church in Amda, a village in the northern India state of Jharkhand. But he also oversees church plants in six neighboring villages within a total radius of 11 kilometers that have no pastors or organized churches of their own. Over the past forty-five years BCM India ministry has grown from three missionaries to 277, out of which 208 serve as church-planting missionaries. 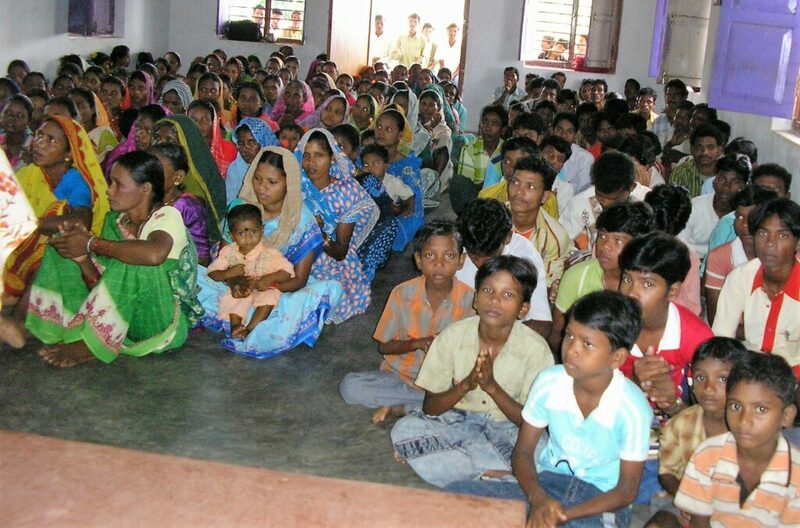 Under their ministry, 485 congregations and 1,513 believer groups (church plants not yet organized into congregations) are reaching their own neighbors with the gospel in fifteen states across southern and northern India. In the last year alone, BCM’s church planting program has reached more than a half-million people with the Gospel of Jesus Christ. 27,453 men, women, and children accepted Christ as their personal Savior, and 4,149 received baptism. This is all good news. But most of BCM India’s church planting ministry takes place in rural areas and remote villages where simply finding a means of transportation to reach isolated communities, church plants, and believer groups is a big challenge. BCM missionary pastors depend mainly upon on local buses or other vehicles that will accept passengers such as cargo trucks or motorcycles. Such public transport often runs infrequently and at inconvenient times for ministry scheduling. So pastors often walk many kilometers to hold a village prayer meeting or outreach program. Other preaching points are in such remote areas there are no roads at all. Enter BCM India’s bicycles-for-pastors program. A single bicycle permits a pastor to travel further and reach remote villages and rural areas with far less effort or time needed. Across Central Asia, a bicycle often plays the role of the family “car” as well, carrying multiple people, shopping, supplies. So access to a bicycle permits a pastor to take his wife along to help with children’s and women’s outreaches, or even another co-worker as well as literature and other supplies. Kendrek Tue is one pastor who had the opportunity to participate in BCM’s church planting training program. Despite lack of transportation, he persisted steadfastly in taking the gospel to remote villages without any church, walking many kilometers each day to do so. The physical toll was often discouraging, but he never allowed his faith to fade away or dwindle. 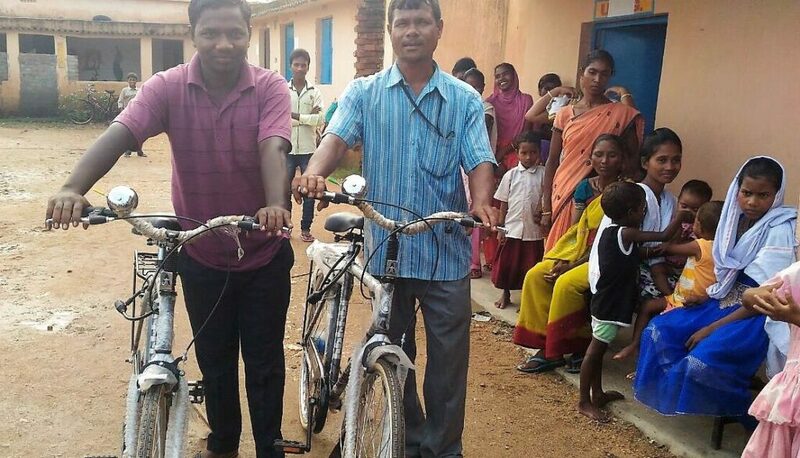 Seeing his faithfulness, BCM India chose him as a candidate to receive a bicycle for ministry travel. Today, Pastor Tue and his wife are traveling together in ministry, and since receiving the bicycle they have been able to add outreaches in eight new villages. “I am so thankful and give praise to God for this gift I have received from BCM,” Pastor Tue expresses. Kendrek Tue is just one of many such pastors who have been blessed through this program. Their ministry responsibilities range from an average 6-8 villages within a radius of 10-14 kilometers. Some travel is for weekly evangelism outreach, but many of the villages have small groups of believers whose only pastoral care and teaching are the itinerant visits from BCM missionary pastors. One BCM church planter, C. Rathan Raj had been serving as pastor for five years in the village of Poolacharla village in the southern state of Andhra Pradesh state. Their church sanctuary is a rented room with a total congregation of thirty-five members. But he travels weekly to the villages of Polampalli (6 kilometers) and Nallampalli (4 kilometers) to hold prayer meetings with believers there and meet other spiritual needs. With no public transportation available, his travels back and forth on foot at night were both difficult and dangerous. Also in Andhra Pradesh, Pastor Samson has been senior pastor for the past four years of the BCM Church Gampalagudem. But every week he is ministering as well to groups of believers in Kamireddy-Pally, a village 12 kilometers distance, and Thotamula, a full 18 kilometers walk each way. Pastor Raj and Pastor Samson were both among a group of pastors who received a bicycle through the BCM India program this past January 2017. Both have been able to expand their ministry greatly in the past year simply by the time and energy saved from walking the long distances. Both have also now been able to bring their wives along to help minister in the villages. A strong, durable bicycle can be purchased locally across India for approximately $100USD. In more affluent or urban settings, such a purchase might not seem a life-changing acquisition. But for rural pastors earning well under $100USD a month, even this simply vehicle is often beyond their economic reach. One single gift of a bicycle can transform their ability to do ministry. Which in turn allows countless more souls to be exposed to the good news of the gospel across India’s vast landscape. 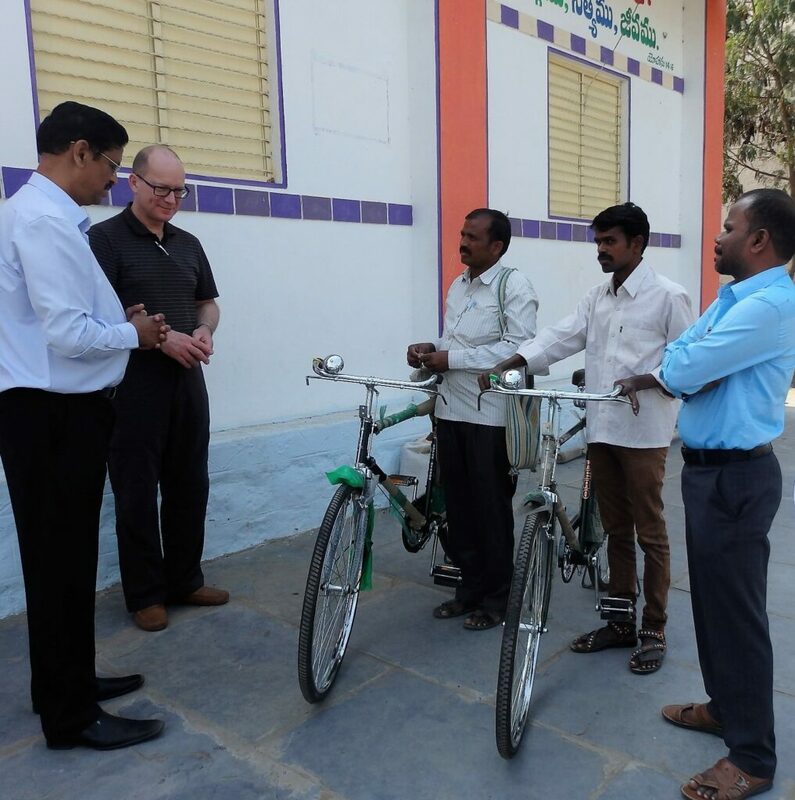 To date, BCM India’s bicycles-for-pastors program has placed 22 bicycles with rural pastors. But 38 more BCM church planters are currently in urgent need of such transport. If you would be interested in sponsoring a bicycle for a BCM India missionary church planter, contact us for more information or fill out the form below to make your donation now.